The Universal Sensor Display provides a convenient and easy way to visually display sensor data. It is capable of reading all Vegetronix brand analog sensors as well as many analog sensors from other manufacturers. The Universal Sensor Display features a back-lit graphical LCD and touch button interface, all in an easy to mount, rugged, water-tight enclosure. The Sensor Display uses water tight cable glands for cable exits. The touch screen is responsive and is protected by the transparent enclosure cover. Using the menu screen, you select the sensor type that you want to read, or you can configure the display to be a voltage meter, event counter, or frequency counter. The measurement units are configurable, and are available in metric or English units. The sample rate, and sensor power on time are configurable. The input readings can be calibrated with an offset, and scaling factor, so that you can fine tune sensor calibration, and accommodate nearly any linear analog sensor. Our design minimizes power usage. In sleep mode the unit consumes only 60uA. The sensor power is only turned on before taking a measurement, and then the display goes back to sleep, until a new sample needs to be taken. The backlight can be configured such that it is on only briefly when the keypad is in use, or constantly on, if power usage is not a concern. Any other 0 to 3V analog sensors. In addition, you can use the Sensor Display as a volt meter, event counter, and frequency counter. We design the Sensor Display with the AquaPlumb in mind. The Sensor Display is a great accessory to the AquaPlumb because it gives you a simple to use visual indicator of water level. You can configure the display so that it indicates either liquid level or liquid volume, and select linear or volume units. 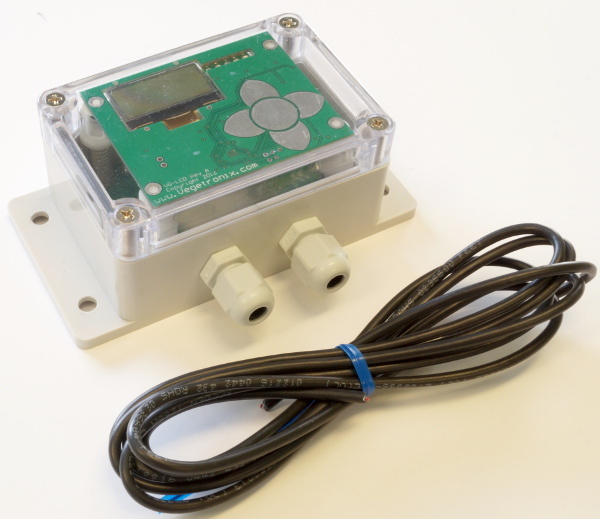 The sensor display in use with an AquaPlumb® Water Level Sensor. Works with all Vegetronix analog sensors. Works with most analog sensors from other vendors. Configurable units in both metric and English. Custom calibration with configurable scale and offset. Water resistant enclosure with a capacitive	touch keypad. Can be used as a volt meter. Can be used as a frequency counter. Can be used as an event counter. Universal Sensor Display Includes: Circuit board, water tight box, power cable, and cable glands. Buy sensors separately. Maximum Sensor Input Voltage 0V to 3.5 VDC. Supply Voltage 3.5V to 20 VDC. The display menu is accessed by pressing the center key on the keypad. You can use the left button to exit the current menu, and to go back to the previous menu. When setting values use the center key to enter and save the value. If you use the left key without pressing the center button, the values will not be saved. Data Display - use the right button to switch between the numerical and graphical display. Voltage - This reads the voltage of the sensor. VH400 - This reads the voltage from a VH400 moisture sensor and displays it as a VWC (Volumetric Water Content) percentage. THERM200 - This reads the voltage from a THERM200 temperature sensor and displays it in degrees Fahrenheit or Celcius. AquaPlumb - This reads the voltage from an AquaPlumb water level sensor and displays it in the AquaPlumb units you have selected. Frequency - This reads a digital frequency (0 to 3V) and displays it in Hz. Counter - This reads a digital pulse count (0 to 3V) and increments and displays the count every time it detects a raising edge of a pulse. Sleep Delay - This determins how long the display stays on, until it goes into sleep mode. If you want the display to remain on always, then set this value to 0. This is not recommended because it it will consume much more power. Sample Delay - This is the sample period, or time between samples. The actual sample period is this time plus the sensor warm up time. Warmup Time - Set this time to the amount of time in miliseconds that it takes for a sensor to warm up and settle. Set this time to zero, if you want the sensor to be constantly powered, and never turn off. Setting the value to zero is not recommend for normal operation, as it will consume much more power. While calibrating an AquaPlumb sensor, set this to zero, and then return it to a non-zero value afterwards, to conserve power. Offset Cal - This is normally set to 1 for voltage sensors. You set this value to scale the read voltage. You will need to set this value for aquaplumb sensors to convert a voltage into a distance or volume. This setting is useful for scaling aquaplumb units to the desired level. Scale Cal - This is normally set to 0 for most sensors. If your sensor has an offset error, you can use this value to compensate. Back light - This turns on or off the backlight. Turn off the backlight to conserve power. 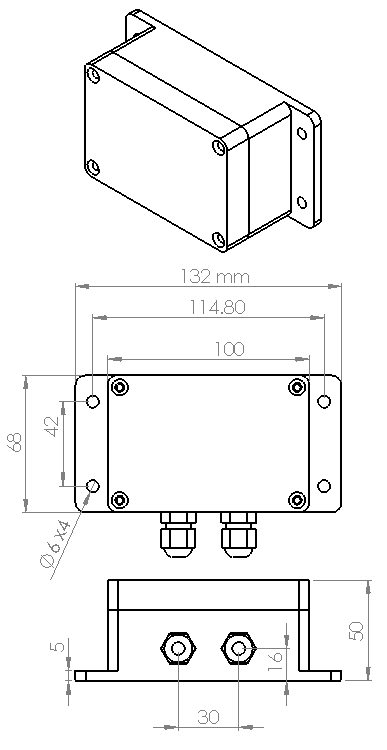 Temp Units - This sets the temperature units for the THERM200 sensor to either °C or °F. Aplumb Units - This sets the units of the Aquaplumb Sensor. Can I place a battery inside the box? This is not recommend, because batteries will off-gas and leak acids into the unit, which can cause damage over time. Off-gassing becomes even more of a problem if the unit is left in sun light or by a heat source. Using batteries in the box, void any warranty. If you still have your heart set on using batteries in the box, then keep one of the cable glands unplugged so that any battery gases can escape. How many sensors can a display read? It can read a single sensor. How often is the screen updated? The screen update period is equal to the warm up time plus the sample period time. How can I keep the display on, so that it doesn't sleep? Use the menu, to set the sleep time to zero. How can I calibrate an AquaPlumb sensor while it is connected to the display? To calibrate an AquaPlumb, it needs constant power. Under normal operation the display only applies before taking a sample, so it needs to be placed in in constant power mode. To do this use the menu, to set the warmup time to zero. Once the AquaPlumb is calibrated, set the warmup time to a non-zero value, to conserve power. The best way to get started is to purchase a few Sensor Display units from our webstore and try them out with our low cost sensors. The display is showing 0V all of the time. Make sure that the scale setting is not set to zero, or another small fractional number. After all when you multiply, any number by zero, you get zero. See the menu section for instructions on how to set the scale and offset settings. The factory default for the scale is 1.0. If the scale is the correct value, then make sure that your sensor is putting putting out a voltage, with the use of a voltage meter. The voltage that the sensor is reading is incorrect. Make sure that the warm up time is set to the proper value. Sensors typically need time for for their voltage output to settle. If the warm up time is too low then the sensor will record an inaccurate value. 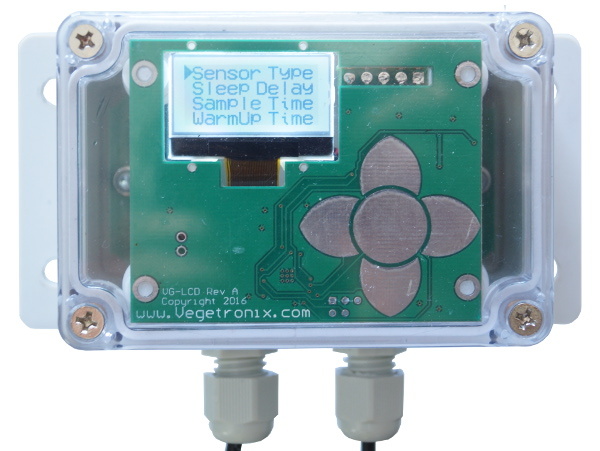 Introducing the Universal Sensor Display The Techno Gardener introduces the universal sensor display, which is capable of displaying data from all Vegetronix brand sensors.